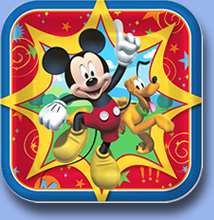 We can help create that 'special atmosphere' to welcome friends, family or business associates to your special event. 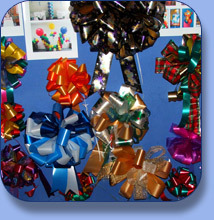 'Wow' them with the extraordinary effect of beautiful Balloons & Bows dcor. Because every venue is different, it's important to know aspects of design and display to maximize your venue's potential. As QBN Balloon artists we use the very best Quality balloons and Bows and have the skills required for stunning displays. By combining helium and air filled balloons we can create exciting displays and custom make our Decorative Bows to add the perfect finishing touch. 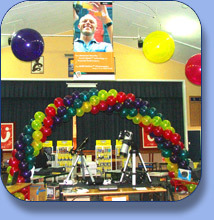 Balloon dcor is one of the quickest, most effective ways to decorate your venue. 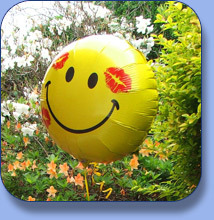 We specialize in designing and creating beautiful Balloon Displays for all kinds of special events. 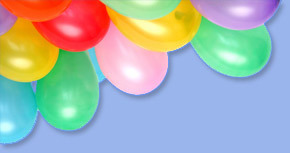 We can colour coordinate our Balloons & Bows to match very closely, if not perfectly, to any colour scheme you may have. Contact us to find out how we can decorate your venue to to suit your specific needs an make an event to remember!